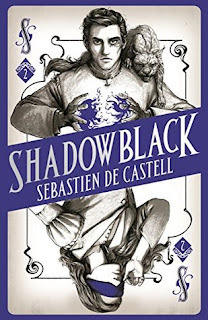 Shadowblack is the second of Sebastien De Castell’s ‘Spellslinger’ series. The first, a cunning blend of coming of age tale, fantasy and weird western, was very enjoyable – so I had high hopes for this one too. Shadowblack re-emphasises a lot of the good things about the first volume, including the sharp banter, the well observed, convincing characterisation, and the world I wanted to see more of, then adds some new narrative spices of its own. Where the first book was set in an oasis of magic users, and centred around Kellen, an adolescent coming rapidly to terms with the fact that he didn’t actually have any magic to speak of, we, along with Kellen, are now outside that oasis, thrust into the wider world and wondering what on earth happens next. Unfortunately, it turns out that the Badlands outside of the oasis are, well, not very nice. There’s radiating heat, scrubby brushland, and rather a lot of horse manure. It’s a barren land with a big sky; to me it evokes a start, Western-style vista. De Castell draws out the difficult beauty of these Badlands in the tribulations of his protagonist – struggling against an uncaring space, but one with a beauty of its own, means that geography helps shape character. If the Badlands, and the fractured region of which they’re a part aren’t enough, then there’s the Academy. A thriving university town, with students from the richest and most influential of this world. If it feels a little parochial in some ways, that just serves to provide a patina of authenticity to the experience. If the Badlands feel like the edge of the world, then the thriving, hopeful town in which the Academy sits is its crowning jewel and greatest contrast. It’s to De Castell’s credit that he makes both environs feel alive. The unlikely trio from the first book are back. I have to admit that for me the star of the show is always Reichis, the squirrel cat. He’s a few pounds of fur, sharp teeth and a sharper attitude. Reichis has a degree of focus which I suspect the other characters envy – he’s a fan of baubles, and of murdering small animals, and as long as nothing interferes with those cat-activities, he’s fairly happy. That said, he also enjoys trying to educate Kellen in the ways of the world, with a distinct lean toward solving problems by disembowelling them. Acerbic, he may be, but Reichis leaps off the page as a convincing portrayal of a person who isn’t also a human. Over the course of the text, he exhibits a bit of personal growth, bringing his team mates a little further into his heart. But in the meantime, his dialogue is sharp, witty, and often hilarious, and the action sequences he appears in are have a penchant for kinetically charged brutality which kept me turning pages. Ferius is Kellen’s other mentor, a traveller with a set of alchemical pouches, cards that are both prophecies and weapons, and her own line in dry repartee. Where Reichis is the personification of the id, Ferius is calmer, more collected. She has her own goals, and a certain enigmatic magnetism. Quite what drives Ferius has remained unclear, but in the interim she serves as a solid counterpoint to Reichis, and as one of the few people around Kellen who seem prepared to let him realise his potential, rather than have him enact some scheme of theirs. Having spoken about Reichis and Ferius, I just want to take a moment to say that the dialogue here is absolutely pitch perfect. The banter has that amiable edge to it, as colleagues and friends take swipes at each other. Where it’s more serious, the emotional payload is raw and convincing, and threats of violence come freighted with depth and weight that gives them serious menace. In either case (and indeed in the more standard everyday chit chat as the characters go about their business) the language absolutely scintillates, and the rhythm and texture of the dialogue goes a long way to keeping the pages turning. That it is (much like in De Castell’s Greatcoats series) by turns hysterical and genuinely emotional and honest is a great help too, of course. Kellen is our protagonist again, and I have to admit, he feels spot on as a teen conflicted about his place in the world. The coming-of-age tale is in full flow here, as he steps into a world which is fairly confident that he isn’t special. Being on the run from his own people, and not entirely willing to share who he is with the world, Kellen is rather occupied trying to work out who he, well, is. Or rather, who he wants to be, now that he’s out from under the constraints of his society. There’s a part of Kellen which is a sulky, surly teen, but there’s a score of moral choice there as well, and the steel of adulthood slowly becoming visible beneath it all. Quite who Kellen is I’m not entirely sure, and he isn’t either, I suspect – but watching him try and work that out, deciding what his own principles and morals are, and what they’re worth, well, it makes for an intelligent, sometimes troubling, but always interesting read. The plot – well, no spoilers here. I will say that it rumbles along at a reasonable pace though. There’s an assortment of trickery, thievery and fast talking. There’s even a little bit of magic, here and there. The stakes, as ever, are high, both personally and in a wider context, and there’s a tension and sense of consequence which ties up with the stellar characterisation and cracking dialogue to keep the pages turning. Is it worth reading? Oh yes. Our trio are always at their best when they’re in hot water, and they’re definitely there this time. This is a worthy successor to Spellslinger, and if you were wondering if the sequel could be as good, I’d say you can now stop wondering, and start reading.